Anyway, who wants to run up there and risk grim death with me? Link. That looks like a well-deserved invitation to immolation for a lot of you. 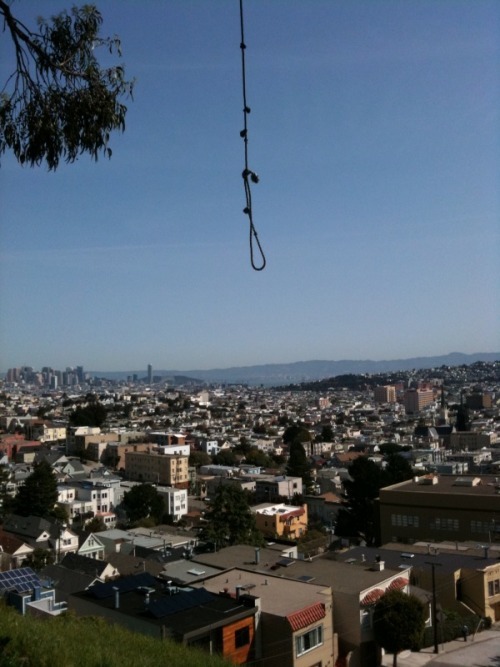 Ahh, I had fun times during high school on that rope swing. Surprised it’s taken so long for people to find it. For a little backstory. There’s been a protracted battle between the residents near the park and Errol Flynn-esque adventurers. Normally, the swing stays around for around 6 months, then gets cut down. The current incarnation is quite shorter than the circa 2000 one (you used to be able to get to the Y of the tree and jump right off). I remember one time during a repair job going to Mission Cliffs and asking for a “length of rope, with a tight loop in it, strong enough to hold a man’s weight.” Kinda awkward. Either way it’s a good picnic-ing / death jump afternoon spot, but not as fun as wax paper and the Seward slides. i injured me sweet arse on that circa-2000 version. an epic day ’twas. Oh, wow. Just what we need, an influx of people on BGH. I fear Seward-esque fallout. Yes, yes, this is my major NIMBY streak coming out, and general defense of what was basically the backyard of my youth, but of all the epic injuries I’ve known from that swing, none actually triggered Serious Intervention From The Authorities. Lots of people not being careful will do just that, and then it’s no fun for anyone.